Can you explain when you would want to do this instead of a continuous line all the way around the tree? What are the benefits? This uses the same concept of a continuous ridge line, only adding the webbing for tree protection and support. 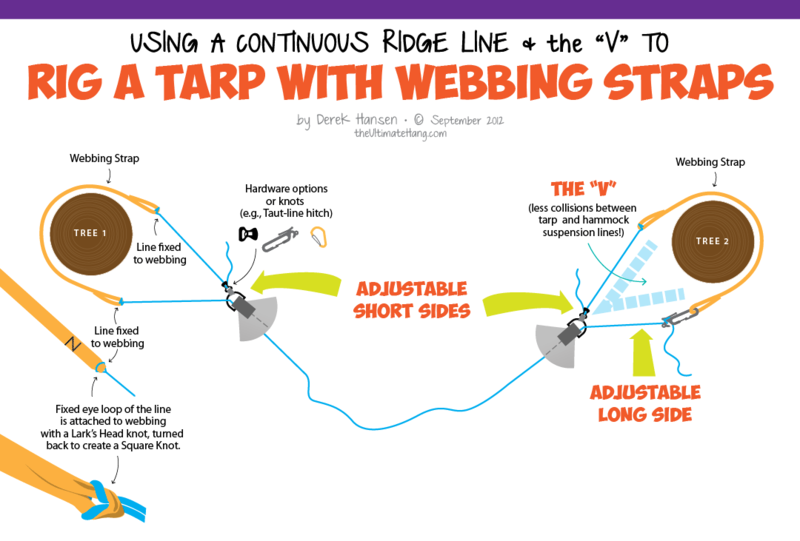 The goal in this particular illustration was to achieve the “V” technique that prevents the tarp and hammock strap from colliding. If you don’t want/need the “V” and still want the strap, you can use the strap separately. In some cases, having a webbing strap for the tarp helps prevent damage. Some folks really crank down their tarp lines and the small diameter line can easily dig into the bark. It isn’t common practice to use a strap with a tarp. The main benefit is damage control. In some places it is just perception, particularly I there is a local rule or ranger that objects. Derek, best ridge line I’ve found for my rain fly is a Coghlan’s bungee clothesline. It’s two small twisted bungees with a plastic carabiner at each end. The length is adjustable. I connect the carabiners to the hammock rings and then connect my rain fly (10’x10′ lightweight tarp) to the carabiners. When I climb in the hammock, the bungee flexes so no need to readjust. The rain fly lowers as the hammock and ridge line drop, reducing air flow between the hammock and fly. The double-bungee clothesline is useful for hanging lightweight items like a headlamp, glasses, fleece hat, glow stick, etc. Endured some pretty heavy rain and a couple inches of snow without any significant problems. Was wondering what you thought about it. derek, being a backpacker, i have been a fan of hammocks and now, i sell them. im glad i bumped into your site. learning so much from what i thought was just a tie around and lay down.